Meal planning is one key to saving money (on groceries and by avoiding restaurant meals) as well as eating a balanced diet. It’s also supposed to save time. If you’re like me, meal planning is not always a walk in the park. You’ve been overwhelmed by planning dinners at home week after week. You might have even felt guilty that you’re not doing it well enough. When I fail to plan our meals, we either end up having the same uninspired meals over and over or we end up spending more money than we budgeted on eating out - simply because I’m too tired and have no idea what to make. As a soon-to-be-married woman last summer, I knew that meal planning was going to be daunting - even though I love to cook and was excited about the idea. I just needed a little help. It’s similar to other meal planning subscriptions (like Blue Apron or Hello Fresh), except that you don’t get the food delivered to you, so it’s waaaay cheaper. In fact, eMeals has been shown to save their customers an average of $200 a month! Emeals is honestly one of the main reasons we are personally able to stick to a grocery budget of less than $80 per week/$360 per month for the two of us! If you get the main plan that eMeals offers, you will receive a straightforward and simple 7-meal dinner plan (including sides) in your email inbox every week. You can also access your plan using their app - more on that later. The dinner plan comes with 7 dinner recipes and corresponding side dishes each week. There are also breakfast, lunch, and special occasions plans you can add, but we haven’t tried these. There are so many different meal plan options! You can always see the recipes on other plans and switch whenever you want via the app or the website! We've tried the Classic, Quick and Healthy, Budget Friendly, Slow Cooker, and Mediterranean plans, and are currently using the 30-Minute plan. It's amazing and so easy! First, choose your plan from the options above, then choose whether you want the family plan for 4-6 people or the smaller plan for 2-3 people. There are 7 recipes on each weekly menu. Each menu includes a huge amount of variety, which is one of my favorite things about eMeals. Meals include a side that pairs with it well (for example, spicy roasted broccoli to go with chicken in a creamy cilantro sauce) - I usually add a second vegetable (or two vegetables if the paired side is a starchy food like rice or potatoes). This is where frozen steamer bags and ready-to-go salad kits really come in handy! 1) a PDF delivered weekly via email or 2) the eMeals app (available for iPhones and Android phones). The items on the shopping list are numbered based on the meal number, so it’s easy to pick out the ones that you need if you’re making, say, three meals from the plan that week. The staples section is a nice reminder to stock up on typical pantry items, like olive oil and salt, if you’re running low. The app is pretty awesome, because you can choose the meals you’re going to make and add the foods for that meal automatically to a grocery list in the app. You also have the ability to send your grocery list directly from the app to Walmart for curbside pick-up or Shipt or Instacart for delivery!! Side note: Walmart grocery pickup is currently FREE if you spend over $30! They shop for your list, you pull up to the store, and they bring your groceries out. So handy! Another cool thing about the app is that if you don’t want to print out the recipes, you can make them using “Cook Mode” on the app. All you do is swipe right after you're done with each step and it takes you to the next one. There’s also a Favorites feature. When you come across a new family favorite, you can click a little heart button at the top of the recipe and it’s added to your personal favorites collection within the app. This is an awesome feature, but I don’t use it that much because I like to write on recipes (I modify 99% of recipes I make - eMeals or otherwise. Is anybody else like me in this??). Since I print out the PDF of my meals, I just write my notes on the page and put the in a page protector in a 3-ring binder where I keep our favorite recipes. Now that you get the idea of how we use eMeals, I want to share what I love about it most! The first reason we love eMeals is that it adds a ton of variety to our weekly dinners. The first year we used eMeals, I had the goal of making 3 or 4 eMeals per week out of the 7 they sent us in our meal plan. This gave us the flexibility of choosing the meals that looked best to us and also helped us try a TON of new recipes. Some of them became favorites that I added to my recipe binder. This year, I only have a goal of making at least 1 or 2 recipes from our eMeals plan each week. Sometimes we make more (like this week! ), but often the rest of our meals are favorites that we like having often, simply because we now have so many favorites! Some of our favorite staples are tacos, homemade pizza, pasta with meat sauce, salmon burgers, and bibimbap from Budget Bytes. It may not sound like a lot to make only 1 or 2 recipes out of the 7 we get from eMeals each week, but by the end of the year we will have tried 50 to 100 new recipes! This is far more new recipes than I would normally try - even if I bought 2 new cookbooks a year (the equivalent of the cost of eMeals). 2. It helps us avoid recipe overwhelm from multiple food blogs & cookbooks. This one is huge. One of my personal weaknesses is that I sometimes struggle with making small, insignificant decisions - especially at the end of the day or when I’m really tired. In fact, I’ve learned that if I’m spending 5-10 minutes going back and forth over a minor decision (like whether we should watch another episode on Netflix or which energy ball recipe to make), it’s a strong indicator that I’m tired. 3. It saves me tons of time planning! Aside from avoiding the decision fatigue from looking through cookbooks and scrolling through blogs, using eMeals to try new recipes saves time! This saves me buckets of time that I would normally spend leafing through cookbooks or scrolling through food blogs looking for the perfect seasonal recipes for the week. I still love reading food blogs and cookbooks, but they take a backseat to eMeals simply because of the time factor. I plan our meals for the week in this order: 1-2 eMeals (unless I don't want to look through cookbooks or make any favorites that week and want to make more eMeals), 2-3 favorites (see above), then a recipe or two from a blog or cookbook only if I have time and feel like it. This way, I don’t feel like I’m locked in to only using eMeals for every dinner recipe, but it’s a consistent source of inspiration and variety for my meal plan each week. 4. The meals are quick to prepare - using the 30-minute meals plan. Another thing I love about eMeals - their 30-minute plan in particular - is how fast and easy the meals are to prepare! We switched to the 30-minute meals plan a couple of weeks ago and I’m extremely impressed! The 30-minute meals are easy to put together without being basic and boring at all. The fact that the meals only take 30 minutes is a huge motivating factor for me when I come home and the thought of spending an hour in the kitchen creates a sense of dread in me. Instead, I know that the meals will be quick and well worth my time. 5. The opportunity for me to try it out for free first! Emeals offers a free two-week trial to see if the product is a good fit for you. I love this! I did a two-week free trial of eMeals over a year ago and decided that eMeals was PERFECT for me! While I am a HUGE fan of eMeals and this is my second year of using it, it does have a few drawbacks to consider. 1. Not all meals are necessarily Mediterranean. 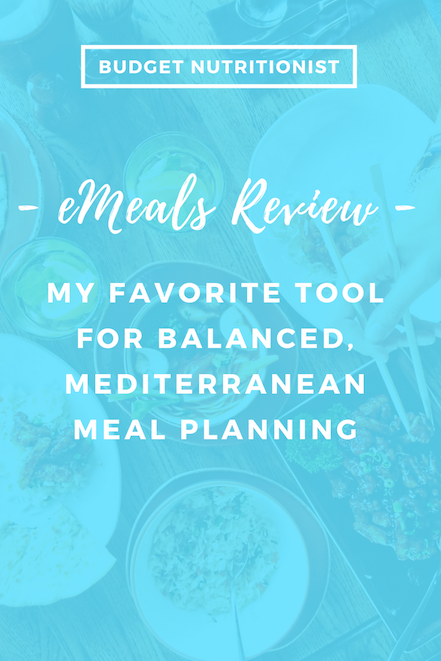 The Mediterranean eMeals plan aligns most closely with my preferred Mediterranean way of eating, but a lot of the recipes on the Mediterranean plan take longer than I'd like (typically more like 45 minutes to an hour). For this reason, we don’t use the Mediterranean plan, but we are still able to easily follow a Mediterranean diet using any plan we choose. Adding an extra side or two of vegetables (Yay for salad kits and frozen steamer bags!). If you resonated with my sense of overwhelm about planning to prepare almost all of our meals at home every week, you run out of ideas for what to make for dinner on a regular basis (like me), or your grocery shopping sometimes gets a little out of control and you spend way more than you expected, you might consider the eMeals two-week free trial to see if it’s a good fit for you! Have you tried eMeals already? What was your favorite plan?